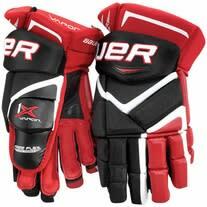 Our hockey gloves are made by the best manufacturers in hockey, such as Bauer, CCM, Reebok, Warrior, Easton and Eagle. Choose between youth, junior and senior hockey gloves in every color and size, from 7" up to 15". Whether you like the feel of traditional 4 roll hockey gloves or more modern-fitting hockey gloves, we have plenty of options in stock and ready to ship. Hand protection is required in every organized hockey league and should always be a top priority when you're purchasing hockey equipment. With so many different brands and models available, it may seem difficult to decide on a pair of hockey gloves without some help. 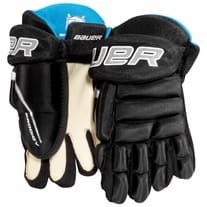 Don't worry, we have plenty of resources to offer you as you browse through the hockey gloves on HockeyGiant.com. Here are some simple directions that will help guide you through your next hockey glove purchase. First, check out our Hockey Glove Sizing Guide to figure out which age group you're in. Youth gloves come in 7", 8" and 9", junior gloves are 10", 11" and 12", and senior hockey gloves are 13", 14" and 15". The easiest way to measure is to start at the base of the middle finger and find the length in inches to the crease of your elbow. That number should be within an inch of your hockey glove size. Next, pick a price range and find a few pairs of gloves that fit your budget. Compare a few different pairs of gloves and see if any of the features appeal to you more than others. 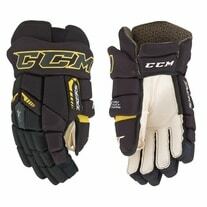 Go to the product page for the hockey gloves you want to order and select the size and color of your preference. 4 easy steps and you're ready to order a brand new pair of hockey gloves. Hockey Giant is proud to carry a large variety of hockey products made by the best hockey equipment manufacturers in the world. Whether you need a new pair of ice hockey skates, a backup composite hockey stick or an extra pair of hockey skate laces, HockeyGiant.com is the place to be.